One of the joys of arranging our English riding vacations is the opportunity to explore some incredible countryside on horseback. As our business grows so does our repertoire of rides, and the first step in planning a new route is to unfold the Ordnance Survey map of a new region and begin connecting the bridleways and spots of interest. From there we tend to trial the route on horseback – which is often quite a long and sometimes frustrating day, with plenty of wrong-turns and adjustments!! One of the things we’ve learnt in preparing these rides is that a beautiful stretch of countryside doesn’t necessarily mean a great ride. Good excursions on a horse require plenty of well-maintained bridle paths, few busy roads and, crucially, the potential for a loop. With this in mind we’ve collected a few of our favourite spots together in the hope they might inspire you to get the maps out and hit some new territory. These are places a little off the beaten track – we all know the riding meccas of Exmoor, the New Forest and the Quantock Hills. We knew we had got onto something special when we opened the map of Cerne Abbas: a positive spider’s web of bridle ways unfolded across the chalk hills around this historic village. Riding here is characterised by the contrast between the high hilltops with big views and even bigger skies and the picturesque valley villages with names like Sydling St. Nicholas and Piddletrenthide. Good pubs for pit stops abound – the Grey Hound in Sydling and the New Inn in Cerne are both worth a visit – and there are some lovely country houses to ogle too (Upcerne and Nether Cerne for starters). What really caps this region though is the versatility for riding – you can plan anything from a short 5 mile loop to a marathon 25-mile ride. The last ride we did here culminated with an incredible picnic on the lawns of Nether Cerne manor – with fresh pizza served out of the back of a converted Land Rover! Many will be familiar with Stourhead for its famous landscape garden and the lovely woodland walks that around its lakes, neoclassical follies and woodland. It’s fantastic equestrian landscape too and one we often introduce our guests to when they first arrive for a foxhunting vacation. There are plenty of good bridle paths around the estate, with a real winner being the route up onto windswept White Sheet Hill where the big house can be glimpsed down amongst the beech trees. 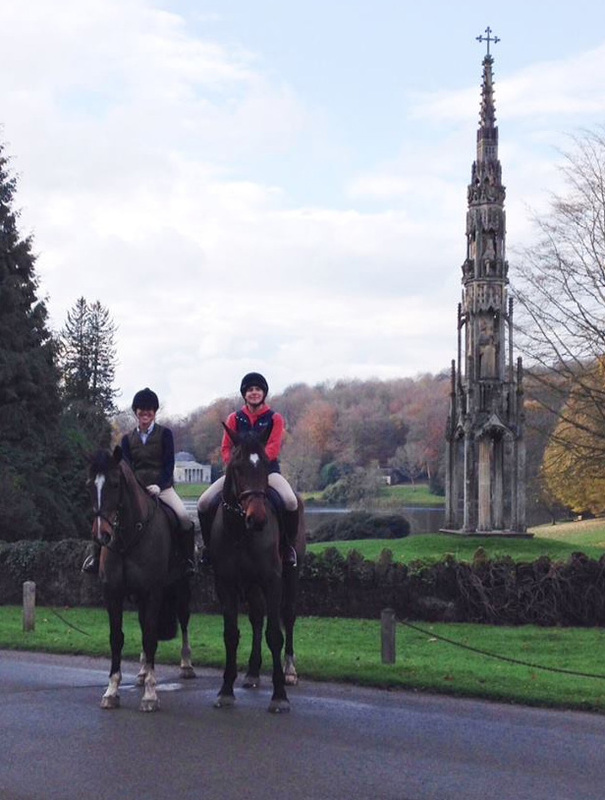 Although the gardens themselves aren’t open to horses, riders can buy an annual pass to ride on the labyrinth of tracks that cover the West Stourhead Estate. These stone tracks are good going all year-round and have access to some lovely spots – such as the grassy mile up to Alfred’s Tower. I challenge anyone not to gallop! The South and West Wilts Hunt have an annual fun ride in the area if you want to spare the tricky navigation. For the perfect ride-to-pub expedition, set your gps to the hills just north of Sherborne, on the Dorset-Somerset border. This is one of our favourite rides (in fact, we’ve blogged about it before – click here for a route map) and it takes the stunning hill country around Corton Denham. Riders are rewarded with a lovely tradition country pub at the end of the day, the Queens Arms is one of our favourites and always welcoming to mud-splattered riders! Plan this ride on a bright clear day as the views along the way are spectacular. One of the best ridges is the Lady’s Mile, which looks down on the picturesque village of Poyntington. Forget taking in the view though – the turf along the top is superb, brilliant for a proper pipe-opener! When it comes to riding, not all beaches are created equal. Despite our proximity to the South Dorset coast, its steep cliffs and rocky bays mean it isn’t really suited to equestrian vacations. Travel South West into North Devon however, and the Atlantic coast has some real treats. 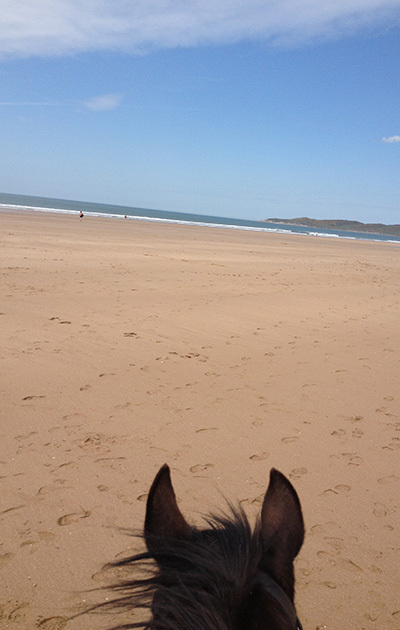 Our favourite spot is Putsborough beach, which is hidden around the corner from surf Mecca, Croyde Bay. With a decent scattering of VW campers and bronzed bodies for added seaside flavour, Putsborough is nearly three miles long and perfect for both a seaside amble or a blast along the sand. You can then head up through the sand dunes onto the cliffs for some unforgettable ocean vistas. We can recommend Roylands Riding Stables if you’re looking for a safe, steady mount in the area. If you’re interested in finding out more about our riding vacations, check out our riding holiday website here, download a copy of our brochure or contact Ben and Megan via holidays@blackthornandbrook.com.